Paul is a Principal Flow Assurance Engineer for Woodside Energy. 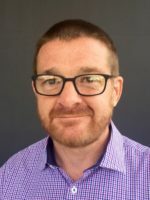 Prior to joining Woodside Paul was the founder of FEESA Ltd, a company formed to develop the Maximus Integrated Production Modelling software used to simulate multiphase, multicomponent flows in pipe networks such as oil and gas production systems. It is a novel application of the equation oriented approach to network flow simulation. More recently Paul held a part-time research post at Imperial College. Since joining Woodside in 2011 Paul has continued his involvement with R&D with strong ties to the FSR team at UWA.